A historic Maine waterfront hotel, Grey Havens Inn overlooks the North Atlantic coast and nearby islands. A beautiful open stairway in our hotel takes you up to the second or third floor to our guestrooms, all with private baths. The four turret rooms on the corners of the building are truly romantic with 270-degree panoramic ocean views. Our largest room, the Sunrise Suite, has its own private deck overlooking the ocean. 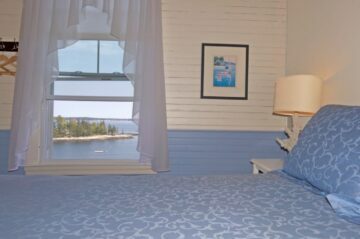 Except for our Cottage room, all rooms have either full or partial views of the ocean, providing some of the best oceanfront lodging in Maine. 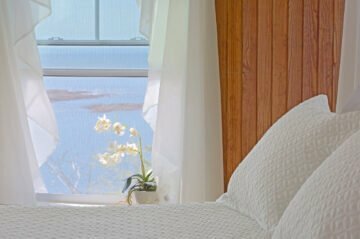 Our Maine coast lodging will welcome you home with authentic Maine charm. Our peaceful atmosphere and beautiful views will beckon you to relax and renew. 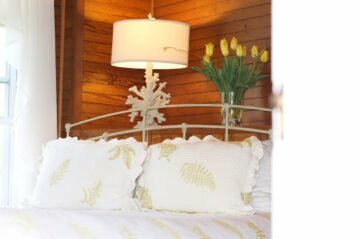 Whether you’re looking for a romantic getaway or a family retreat, the rooms at our inn are well-equipped for any occasion. Every room and suite at our waterfront hotel comes with continental breakfast at our signature restaurant, Blue, luxury toiletries, a hairdryer and iron and wireless internet. If you’re looking for a Maine waterfront hotel with a Jacuzzi in the room, look no further than our rooms and suites. We have two rooms that are equipped with a Jacuzzi, both with incredible harbor and island views. Our Sunrise Suite also has its own private balcony overlooking the ocean. 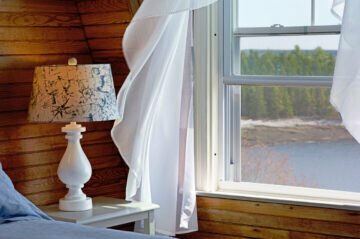 Experience authentic waterfront lodging in Maine without sacrificing the opportunity to travel to popular areas nearby. We are less than a 20-minute drive from Bath, Maine, and a mere 20-minute boat ride from Boothbay. 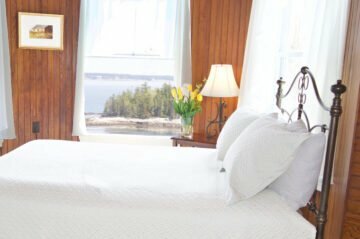 Explore all of our thirteen lodging choices below and experience the charm of our Maine waterfront hotel in Georgetown. Get the best cost and convenience when you book directly with us! 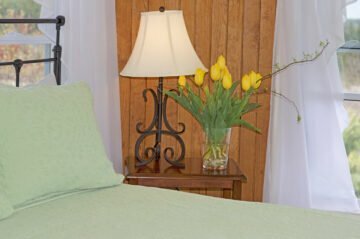 Located at the back side of the inn with a king bed, private bath and shower. The room has a peek at Harmon’s Harbor from the side window. 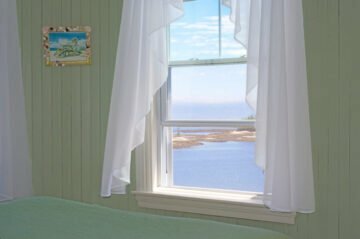 A turret room painted a lovely sea foam green with a queen bed, a private bath with tub and shower and an outstanding 270-degree view of the ocean and islands through three windows. A smaller oceanfront room painted in blue and white with a queen bed, smaller private bath with shower and a nice view of the ocean. 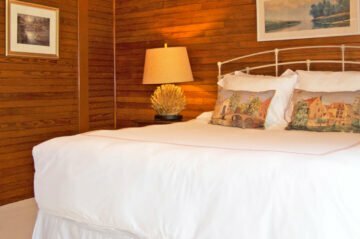 A turret room with natural wood, a queen bed, private bath with tub and shower and an outstanding 270-degree view of ocean and islands through three windows. A room on the back corner of the inn with a peek at the water through a side window, a queen bed and private bath with tub and shower. 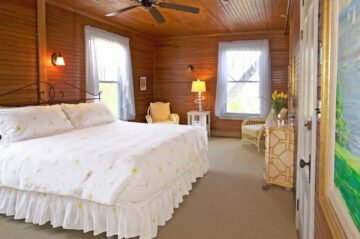 A quaint and cozy room with natural wood on the back side of the Inn with a queen bed and private bath with tub and shower. This room has no ocean view. 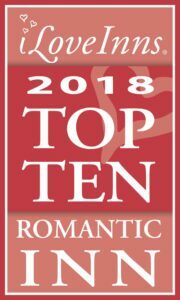 A large, sunny room on the back corner of the inn with a queen bed, as well as a twin bed, private bath & shower and a side view of Harmon’s Harbor. This room will accommodate a third guest for an optional fee. A turret room with natural wood and a queen bed. The room features a private bath with shower and an outstanding 270-degree view of the ocean and islands through three windows. An oceanfront room with a queen bed. The Tides has a private bath with shower and a nice ocean view. 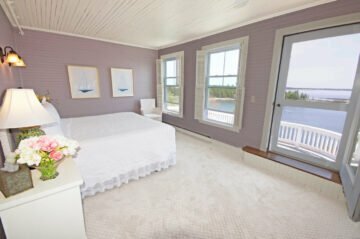 A larger oceanfront room painted a lovely periwinkle blue. 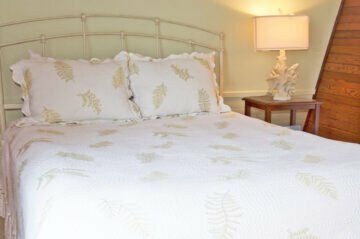 The Harbor Suite has with a king bed, private bath with shower, and a lovely ocean view. A turret room with natural wood and a queen bed with outstanding 270-degree view of the ocean and islands. The room has a private bath with a Jacuzzi tub and separate shower. 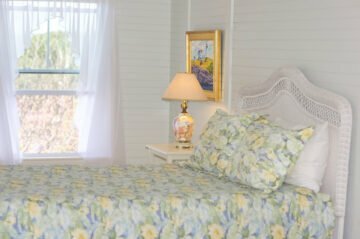 A room on the back corner of the inn with a limited view of the ocean from a side window, a queen bed and private bath with shower.